Over the years, Windows has gotten progressively better at laptop power management--but it still doesn't tell you much about your battery. 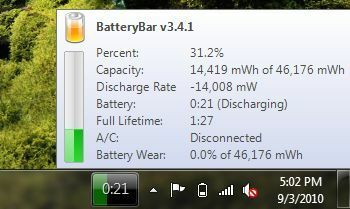 Enter BatteryBar, a free, easy, ingenious power gauge that's compatible with XP, Vista, and Windows 7--and should have been built into all three of them. Typically, you have to mouse over that tiny System Tray power icon if you want Windows' read on how much battery life is left. BatteryBar adds a full-time, at-a-glance gauge to the right side of the taskbar, which, by itself, is mighty handy. That gauge shows you either a percentage of battery life remaining or the amount of runtime left; clicking it toggles between the two readings. Interestingly, when you're running on AC power, the gauge switches from green to blue and shows how long until you reach a full charge. But wait, there's more: when you mouse over the gauge, a pop-up window displays a boatload of additional information, such as total battery capacity, charge/discharge rate, AC status, and even a lifetime estimate based on historical charge/discharge data. That's what I'm talking about! Although BatteryBar is free, there's also a Pro version that adds more features, like a graph of battery profiles, low/critical power warnings, and automatic power-scheme switching that kicks in when you switch between AC and battery power. How much? The developer sort of lets you choose your own price: $3 for a one-year license, $5 for two years, or $7-9 for lifetime. Pony up $10 and you get two lifetime licenses. While I suspect most users will be happy enough with the free version, I admire this creative approach to pricing. I love this program. 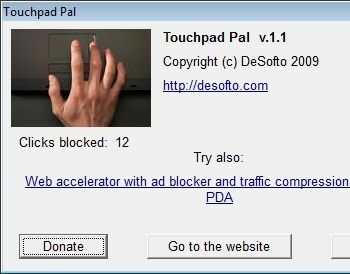 Don't run a laptop without it.